1. A collection of axons establishing a conduction route for nerve impulses from one group of nerve cells to another group or to an effector organ composed of muscle or gland cells. 2. Any sequence of chemical reactions leading from one compound to another; if taking place in living tissue, usually referred to as a biochemical pathway. 1. a course usually followed. 2. the nerve structures through which an impulse passes between groups of nerve cells or between the central nervous system and an organ or muscle. accessory conducting pathway myocardial fibers that propagate the atrial contraction impulse to the ventricles but are not a part of the normal atrioventricular conducting system. afferent pathway the nerve structures through which an impulse, especially a sensory impression, is conducted to the cerebral cortex. alternative complement pathway a pathway of complement activation initiated by a variety of factors other than those initiating the classical pathway, including IgA immune complexes, bacterial endotoxins, microbial polysaccharides, and cell walls. It does not include factors C1, C2, and C4 of the classical complement pathway but does include factors B and D and properdin. amphibolic pathway a group of metabolic reactions providing small metabolites for further metabolism to end products or for use as precursors in synthetic, anabolic reactions. circus pathway a ring or circuit traversed by an abnormal excitatory wavefront, as in reentry. classical complement pathway a pathway of complement activation, comprising nine components (C1 to C9), initiated by antigen-antibody complexes containing immunoglobulins IgG or IgM. common pathway of coagulation the steps in the mechanism of coagulation from the activation of factor X through the conversion of fibrinogen to fibrin. 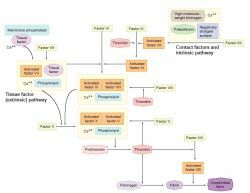 efferent pathway the nerve structures through which an impulse passes away from the brain, especially for the innervation of muscles, effector organs, or glands. Embden-Meyerhof pathway of glucose metabolism. extrinsic pathway of coagulation the mechanism that produces fibrin following tissue injury, beginning with formation of an activated complex between tissue factor and factor VII and leading to activation of factor X, inducing the reactions of the common pathway of coagulation. final common pathway a motor pathway consisting of the motor neurons by which nerve impulses from many central sources pass to a muscle or gland in the periphery. intrinsic pathway of coagulation a sequence of reactions leading to fibrin formation, beginning with the contact activation of factor XII, and resulting in the activation of factor X to initiate the common pathway of coagulation. 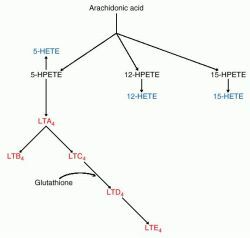 lipoxygenase pathway a pathway for the formation of leukotrienes and hydroxyeicosatetraenoic acid from arachidonic acid. Lipoxygenase pathway of leukotriene and hydroxyeicosatetraenoic acid synthesis. HPETE, hydroperoxyeicosatetraenoic acid; HETE, hydroxyeicosatetraenoic acid; LT, leukotriene. metabolic pathway a series of enzymatic reactions that converts one biological material to another. motor pathway an efferent pathway conducting impulses from the central nervous system to a muscle. 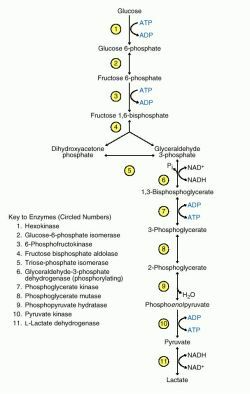 pentose phosphate pathway a major branching of the Embden-Meyerhof pathway of carbohydrate metabolism, successively oxidizing hexoses to form pentose phosphates. reentrant pathway that over which the impulse is conducted in reentry. a. A course usually followed by a body part or process. b. A chain of nerve fibers along which impulses normally travel. c. A sequence of enzymatic or other reactions by which one biological material is converted to another. 1 a network of neurons that provides a transmission route for nerve impulses from any part of the body to the spinal cord and the cerebral cortex or from the central nervous system to the muscles and organs. 2 a chain of chemical reactions that produces various compounds in critical sequence, such as the Embden-Meyerhof pathway. The route by which a process occurs. The route by which a thing occurs. See Critical pathway, Fifth pathway. any defined route followed by a series of reactions leading to a specific product, e.g. a biochemical pathway. 1. A collection of nerve fibres (axons) along which nervous impulses travel. 2. A path or a route. geniculocalcarine pathway See optic radiations. geniculostriate pathway 1. See optic radiations. 2. Some authors consider this term to be a synonym of visual pathway. magnocellular pathway See system, magnocellular visual. motor pathway Pathway from the cortex to the muscles that control the movements of the eyes enabling them to act as a unit. parvocellular pathway See parvocellular visual system. retinotectal pathway 1. The nervous pathway connecting the retina to the pretectal region (anterior to the superior colliculi) and from there to the Edinger-Westphal nucleus. It is involved in the pupillary light reflexes. 2. The nervous pathway between the retina and the superior colliculus. It is involved in the involuntary blink reflex to a dazzling light and in the eye movements occurring in response to the sudden appearance of a novel or a threatening stimulus. See blind sight; pupillary fibres; pupil light reflex; pretectum. uveoscleral pathway An unconventional route through which the aqueous humour drains out of the eye. The aqueous passes from the anterior chamber across the iris root through small spaces between the ciliary muscle fibres into the supraciliary space and suprachoroid space. The fluid is believed to escape the eye via veins in the ciliary muscle and anterior choroid. The amount of aqueous outflow through this route amounts to between 10% and 15%, the rest flows out through the conventional pathway via the trabecular meshwork and into Schlemm's canal. Prostaglandin drugs reduce the intraocular pressure by increasing the outflow through the uveoscleral pathway. This pathway is occasionally made use of in cyclodialysis. visual pathway Neural path starting in the photoreceptors of the retina and travelling through the following structures: the optic nerve, the optic chiasma, the optic tract, the lateral geniculate bodies, the optic radiations and the visual cortex where the pathway ends. The fibres of the optic nerve of one eye meet with the fibres from the other eye at the optic chiasma, where approximately half of them (the nasal half of the retina) cross over to the other side. Thus, there is semidecussation in the visual pathway (Fig. P3). See visual area; decussation; cortical magnification; retinotopic map. 1. Collection of axons establishing conduction route for nerve impulses from one group of nerve cells to another or to an effector organ composed of muscle or gland cells. 2. Any sequence of chemical reactions leading from one compound to another.